It’s already May and that means it’s almost time for the area’s biggest metal event of the year, Maryland Deathfest! Soon I’ll be posting the annual Maryland Deathfest Survival Guide but to get our MDF coverage started a little earlier this year we’ll be reviewing the latest albums by some bands playing MDF that aren’t the big headliner acts but are smaller bands you won’t want to miss. These reviews will cover a bit more background about these more obscure acts in their reviews and hopefully they’ll convince you to get into their music before heading to Maryland Deathfest XII. Sometimes at Deathfest bands come over that are a bit past their primes but Mgła is a band hitting their stride right now. Tal wrote this review and as always you can read more of her material on her own personal blog here. Be sure to stream the songs at the end of this post and start getting psyched for Maryland Deathfest XII! Mgła is pronounced “mgwah” and means “fog” in Polish. Now that we’ve gotten that out of the way, let’s talk about what they actually are – a black metal band from Kraków, Poland, known in underground circles for their melodic grooves, which don’t get in the way at all of being dark and Satanic. They were solely a studio act for the first twelve years of their existence, but have recently begun to perform live shows, and we’ll be lucky enough to see them appear at this year’s Maryland Deathfest, their first ever US appearance. Mgła consists of Mikołaj “M.” Żentara on guitar, bass and vocals and Maciej “Darkside” Kowalski on drums, both of whom are also in the black metal band Kriegsmaschine (which is a bit heavier and less melodic than Mgła). Mgla was something of a studio side project for these guys, but the two bands switched roles in 2012. The band explained on their Facebook page (here), “Primary reason for playing live is will to perform music in complete band setting. Attempt was made after Kriegsmaschine essentially became a studio project; roles switched as KSM used to operate as ‘band’ and Mgła as ‘project’.” Since starting to tour, Mgła has found “much higher interest that anticipated” in their live shows. 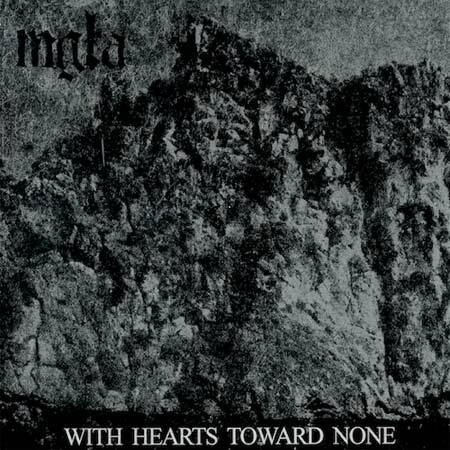 This is undoubtedly partly due to their 2012 release With Hearts Toward None, which was enthusiastically welcomed by the underground black metal community. The band weaves together melodic leads, cascades of atmospheric guitars, blasting drums and crushingly evil growls into a mind-bending juxtaposition of beauty and light with darkness and annihilation. The album really gets good around the IIIrd and IVth track (the tracks don’t have unique names, but are just identified with Roman numerals after the album name), when the guitars get really groovy, without losing the atmospheric feel. Some may find it repetitive, but I could listen to these riffs wash over me all day. I also found myself frequently noticing the cymbals; they’re very distinct and Darkside uses them to create some unusual rhythms. In “III,” the contrast between music and lyrics is starker, as the lyrics describe a world of darkness and ruin, covered in gray ash and despair, and yet the guitars seem filled with light and hope. There was a ray of hope in the lyrics with the lines, “And you shall know perdition/And it will set you free.” By “VI,” though, this hope is no more; the end of the song calls for the day “Where all flesh dies/that moves upon the earth/And this rotten cesspool/is swept clean.” Gone is the supreme confidence in the self of the first song; nothing is worth saving. It’s like the worst moments of depression, when there is absolutely no point to anything. The last track seems to actually act out this nihilistic wish in a storm of destruction; the ten-minute song finishes with a couple of instrumental minutes, where the drums suddenly go into a frenzy about a minute from the end, faster and faster, the storm overtaking us, and waves of atmospheric guitars inexorably wash over us, until finally the guitar fades out as all is destroyed. I suppose to some the end of the world is beautiful. Contradictions are inherent in almost everything in existence, though, and the tension created thereby makes the music more interesting – the melodic grooves are all the more enjoyable for being presented alongside loathing for society, humanity and existence. Your chance to see Mgła rain annihilation live will be on Friday, May 23rd at 3:45pm at the Edison Lot’s outdoor stage B. They’ll probably also play material from their previous releases, which include one other full-length, Groza (2008) and several EPs. Based on YouTube videos and the band’s own comments, you can expect a very simple stage show. The band appears in leather jackets over hooded sweatshirts, grim but not overly theatrical, and the lighting is atmospheric but unvarying, evoking the fog their name refers to. There are no stage antics – in fact, hardly any movement at all. The band has commented (here), “Presentation of Mgła live is simple to the point of unattractive. We do not use any symbolism or other ‘hints’ how to interpret as most natural response is the most welcome. Everyone is encouraged to think for themselves.” A very Satanist approach, actually. And in fact, their appearance seems to create just the right amount of atmosphere for getting into the dark mood of their music, without distracting at all from experiencing the music itself. Mgła was in fact the band that convinced me that I should attend Maryland Deathfest this year, so I hope you’ll join me as they bring down the end of the world on May 23rd. 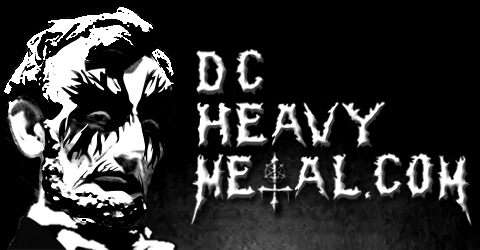 Even if you’re not a diehard black metal fan, their melodic grooves should get you headbanging.